The Most Successful Inbound Marketing & Sales Strategy. Ever. the Sales & Marketing Strategy Blueprint. Your marketing needs a clear, strategic goal - and plan to achieve it. Inbound marketing and inbound sales can deliver lasting results. But even experienced marketers can be overwhelmed when it comes to creating an effective marketing plan. We'll work together to build your strategy – starting with your customized inbound marketing blueprint. This 28-page documented blueprint outlines, step by step, what is needed to meet your sales and marketing or recruitment goals. Are you getting enough traffic to your site? It's impossible to convert prospects to leads if they're not finding your site. Make sure you're converting as many of your prospects as possible with your design and content marketing strategy. If you aren't converting quality leads, you need to examine your strategy to ensure you're attracting the best prospects. The entire purpose of your marketing investment is to close more customers. If you're not succeeding, it's time to take a look at the process as a whole. 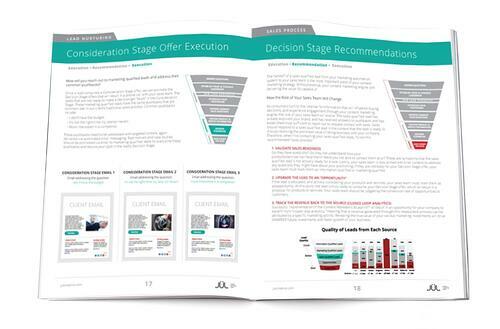 What Is the Sales & Marketing Strategy Blueprint? Your plan to turn your marketing into new customers. The Sales & Marketing Strategy Blueprint is a detailed design for building your organization's complete digital marketing strategy. The blueprint provides everything you need—tools, strategies, metrics, and content titles—to execute an inbound marketing campaign from top (attracting prospects) to bottom (closing customers). The blueprint maps out a 3-6 month content strategy around the three primary pain points that your prospects are facing, based on interviews we do with them, which means every title is relevant to your prospects. The blueprint jumpstarts your inbound marketing machine and, as the engine runs, provides actionable data to turbocharge your inbound marketing efforts. Download this awesome guide now. Click here. We'll create semi-fictional characters representing your ideal customer, based on research and real trends. These personas guide the content creation; after all, you're writing for them. This plan serves as your monthly to-do list for content creation. It'll include content that appeals to your prospects at every stage in their journey and addresses their true concerns, filling your funnel with content that converts. We'll create custom workflows designed to guide your prospects down the sales funnel, using highly targeted content and personalized actions along the way until they're ready to speak with someone from your company. We'll do in-depth research into keywords relevant to your industry and target market. You're writing for people, but this research serves as a guide and enables you to reap SEO benefits. We'll create a comprehensive list of offers – titles and summaries – that generate leads at each stage of the funnel, including eBooks, guides, and other premium content. Here's where we put it all together. Each month you'll receive a detailed analysis of the leads that your inbound marketing has generated, along with recommendations to improve your marketing and sales machine. The Sales & Marketing Strategy Blueprint: the Most Successful Inbound Marketing Strategy Ever.